Five-Day Option: We are offering a five day trip for those members that wish to meet our team on day 9 of the itinerary in Dzongla and arrange their own trek before and after the 5 days of glacier travel. All of the services provided to our full-service members will be offered to members who wish to only do the 5 day program. This may be a great option for those who are participating in other treks/climbs in the region. Five day option cost: $1350 USD. Everest Basecamp Extension Option: For those members wishing to see Everest Basecamp after the Glacier School, we are offering a 4 day extension. You will branch off from the main team on day 12 of the itinerary and together we retrace the rest of the classic "Everest Approach March" made by Hillary and Tenzing Norgay Sherpa, as well as climb Kala Patar (5,545 metres/18,200 feet). For more about the route to basecamp, please click here. 4 day Everest Basecamp extension cost: $600 USD. Trekking: The cost of this expedition includes one of the most beautiful treks in the world. 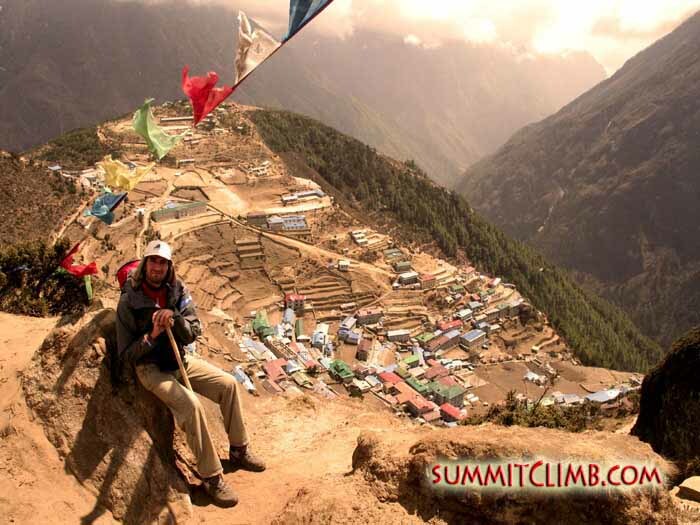 For more information and photos, please visit our Everest Basecamp trek. The trek follows almost the same route as Everest Basecamp, with the exception of branching off to the Cho La Glacier, southwest of Everest (photo right by Tunc Findik: Namche Bazaar, the capital of the Sherpa people. See this unique village on our trek to and from basecamp). Sherpas and Equipment Transport: Our expedition includes transport of all of your equipment from Kathmandu to your destination, and returned to Kathmandu, including internal/domestic flights from Kathmandu-Lukla-Kathmandu. While climbing on the mountain, we DO NOT ask our members to carry heavy group equipment (although it is an option if you really want to), such as tents, rope, fuel, food, etcetera. We employ climbing sherpas, and high-altitude porters, to carry group equipment and supplies. Cooks and Food: On the trek our experienced trekking cooks provide delicious meals. Our skillful and hard working cooks prepare three hot meals each day with a very healthy diet of fresh vegetables, cheeses, eggs, and fresh as well as tinned fruits, meats and fish (all meats and fish are prepared separately out of respect for the vegetarians in our midst). They supply you with unlimited hot-drinks, the key to successful acclimatization. We have large weather-proof kitchens and dining tents, with comfortable chairs and tables. On the mountain, above basecamp, we provide you with abundant and nutritious locally available quick-cooking food, so that you may prepare at least three meals and lots of hot drinks each day, in our specially designed high-altitude stoves using our butane-propane expedition mix fuel. Hotel: Your trip includes 2 free Kathmandu hotel nights at the beginning and two free Kathmandu hotel nights at the end of the trip. You will be sharing. If you want your own single room, the cost is an aditional $25 per night. This a clean and comfortable "two-star" hotel. We use good quality hot water hotels in a central neighborhood, near many tasty restaurants, and excellent mountain equipment and gift shopping, as well as our trekking and mountain climbing office where we meet before and after the adventure. Group Equipment: We provide a plethora of top-quality, and time-tested equipment, group gear, and supplies, including: rope, ice, rock, and snow anchor protection; basecamp and altitude tents; cookers, fuel, high-altitude food, walkie-talkie radios, bamboo marker wands, etcetera. Please see the above EQUIPMENT link, to study what we bring for your use and safety. Safety: Our expeditions are allowed access to our extensive communications equipment, medical supplies, first-aid kits, medical oxygen, and a gamow bag in case of emergency. Thank you for being a well-prepared and safe team member! Visa and Passport: Your Nepal visa is conveniently purchased by you upon arrival at the Kathmandu airport. It is not necessary to purchase a Nepalese visa prior to landing in Nepal. In 2017, the cost of a 90 day visa was $100 USD. 30 days visa cost $60. Please bring cash and 2 extra passport-sized photos (extra photos are necessary to obtain the visa in the airport). Thank you. Please Note: Your passport must be valid for at least 6 months fom the END of the expedition and contain at least 2 blank pages. We recommend the following tip for our group staff: Everest Glacier School : $100. Expect to pay the above tip no matter what. For the "summit-attempt bonus" a group Sherpa who helps you to climb above the high camp or up to the summit and back down, expect to pay $150 per sherpa. That amount of money may be split between the climbers in the summit party. 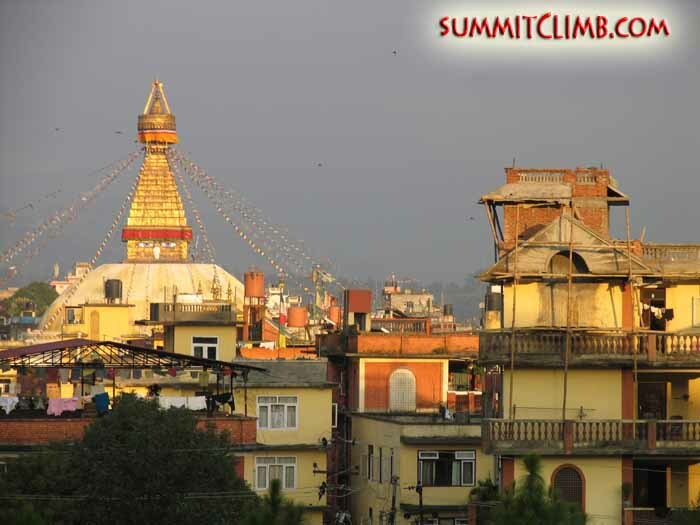 (photo right by Elselien te Hennepe: A view of Swayambhunath Stupa, the "Monkey Temple". It is the most ancient and enigmatic of all the holy shrines in Kathmandu valley. Swayambhunath's worshippers include Hindus, Vajrayana Buddhists of northern Nepal and Tibet, and the Newari Buddhists of central and southern Nepal. Each morning before dawn, hundreds of pilgrims will ascend the 365 steps that lead up the hill, file past the gilded Vajra (Tibetan: Dorje) and two lions guarding the entrance, and begin a series of clockwise circumambulations of the stupa. On each of the four sides of the main stupa there are a pair of big eyes. These eyes are symbolic of God's all-seeing perspective).